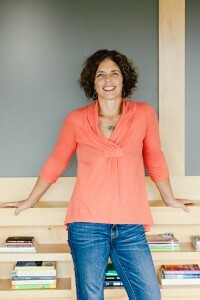 This month Austin SCBWI member Liz Garton Scanlon answers some questions for our chapter. Liz is a prolific writer, a talented teacher, and a generous creative spirit. Her life and her words have touched many of us, and it's a pleasure to get to know her better here as she talks about life in a small town, life with teenagers, and a rich writer's life. I grew up in the Rocky Mountains in a teeny little town that later turned into a swanky ski resort. As a teen, I moved with my family to another teeny town in the midwest, leaving the mountains behind for a lovely little lake. Both places were (and are) exceedingly beautiful — I mean overwhelmingly, naturally beautiful, poetically beautiful — and I deeply value that. I look for beauty in relationships, and in books and music; I look for it on my walks and in my daydreams. I think if we, as human beings and as artists, ever come anywhere close to the beauty of the natural world in who we are and in what we make or do, then we're doing a good job. Well, for most of my childhood I wanted to be an actress who lives on a horse farm. But honestly, I squirm in the spotlight and am too introverted to be an actor, so this is a much more perfect fit. (Although I still wouldn't mind the horse farm.) English was always my favorite subject in school, my undergraduate degree was in journalism, and poetry pulled me through a couple of pretty dicey years of young adulthood so I guess I knew pretty well by then, even if I didn't find my way to children's literature for another dozen years or so. Two vibrant, funny teenagers, a very tall husband, pets who drag mud into the house, a pair of running shoes, a radio, a Macbook Air with a red cover, a stack of books to be read on my bedside table. Black leggings and t-shirts, a big backyard, a hot cup of decaf coffee or home-brewed chai. A yoga mat, an iphone, multiple pairs of drugstore readers, humidity-inspired hair. In the summer you'd see me stealing hours to write every so often. (I spend a lot of downtime with my family each summer — swimming, camping, road-tripping, rejuvenating.) In the winter, something that more closely resembles a schedule emerges. I'm alone, writing, with pets and laptop, in a quiet house most everyday, although I always get out for a hike or run, and I try to fit in coffee or lunch with other writers every other week or so. And then there are days that I take off the leggings and t-shirts and get properly attired to do school visits. I don't get any writing done on those days, and I come home hoarse and exhausted but boy, do I love school visits. My daughters inspired me to start writing for children when they were just babies and toddlers and I was reading to them all the time, so honestly, my life with my family is inseparable from my life as a writer. I know lots of folks think parents might not have the time or the headspace to do this kind of work, but I don't know that I'd be doing it at all if I weren't a parent. Oh, gosh. I don't really like questions like this. I mean, I would like to say my kids are an accomplishment but really, I feel like they are just these amazing people who turned up at our house and we do our best to feed them, clothe them and let them be who they're meant to be. And my writing doesn't really make me feel proud — it makes me feel lucky. Really. I think the most surprising thing is that this very solitary endeavour has delivered so many deeply loving, funny, wise and inspiring people and relationships into my life, from my collaborators and my peers, to my readers and the people who choose and champion books for children. I may work very much on my own most of the time, but I feel less alone now than I ever have in my entire life. Oh, gosh. Comfort and connection. A good laugh. Some fine line between familiarity and delightful surprise. But honestly, I don't really think about that sort of thing when I'm writing. I just do my best to tell the story or fulfill the vision that is in my head and heart, and then I hope that lots of different people will find something special and particular in there for themselves when they pick up the book. The readers are co-creators, really, and they each find something new and different because they each bring something new and different. I love that. 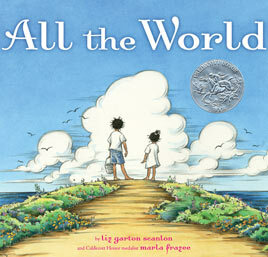 Liz Garton Scanlon is the author of the highly-acclaimed Caldecott-honored picture book All the World, illustrated by Marla Frazee, as well as the recent The Good-Pie Party, illustrated by Kady McDonald Denton, Happy Birthday, Bunny illustrated by Stephanie Graegin, and others. Her first novel for young readers, The Great Good Summer, is due in 2015. Ms. Scanlon is also a poet, teacher and a frequent and popular presenter at schools, libraries and conferences. To learn more, visit her web site at www.LizGartonScanlon.com.